Depending on who you talk to, bounce rates can be defined differently, but the vast majority consider a “bounce” as anytime a user clicks through to a website and clicks off after viewing only one page. The users can leave for a number reasons, all of which need to be investigated. 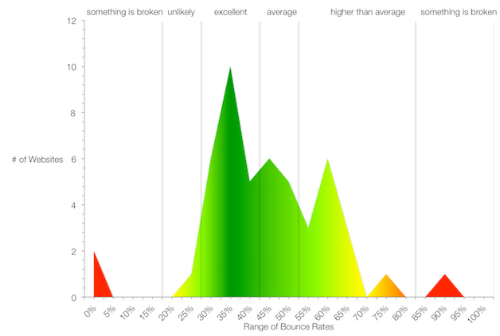 Average bounce rates across websites are about 49%. That being said, the bounce rate that you should shoot for if you are an eCommerce site should be lower as you are selling products not exchanging ideas (like on news sites) — every visit has a dollar sign on it. Shoot to land between the 10-40% range, obviously the lower the better. Looking to boost your SEO? Reducing your bounce rate is a critical step. As top search engines start to use other indicators besides keywords to boost pages, Google, for example, will take into consideration how long a viewer is staying on your page as it speaks directly to how strong your products and content are. If a user leaves your page after a few seconds as opposed to spending time going through several landing pages on your site, that’s an immediate indicator that something is either working or not working. All of this said, you can see the importance of keeping customers on your page for as long as you can. Here are seven tips on how to reduce bounce rate on a website. By following these seven simple steps you’ll be on your way to reducing your website bounce rate and boosting your SEO! Any other tips? Feel free to comment below.